Official Mission: Starting with curious kids, give them the desire, the skills, the confidence, the competence, and the resources to build cool stuff. Kids graduate from Ascendly classes thinking like an engineer, talking like an engineer, building like an engineer, and solving problems like an engineer. Un-Official Mission: Build awesome stuff using LEGO bricks, maybe some robots, too. Our Beliefs: We believe tinkering is good. 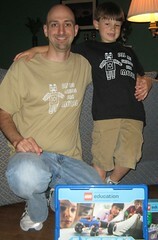 We believe that making the simple stuff, when young, prepares kids to build super cool stuff, when slightly less-young. Everyone, rich and poor, young and old, girls and boys, when exposed to well designed experiences, can gain the enthusiasm and skills needed to become a young engineer. We expect all members of the Ascendly community, employees, volunteers, and students to behave in the highest professional manner and we teach professionalism as part of the curriculum. We know that not every kid will grow up to be engineer, but we believe that every kid deserves to be taught the skills and mindset needed to build things and to understand how things get built. Each lesson not only motivates young kids towards engineering, but also starts to infuse them with the skills and mindset needed to become a young engineer. Our approach works at both the Kindergarten level as well as with significantly older kids. By starting while the kids are young, we build upon an ever increasing skill set, so that by the time they are old enough to start building an objectively complicated undertaking, such as a robot, they are ready for the challenge as a simple logical step in their ongoing growth. This approach contrasts with one that expects a wide range of students, with little engineering background, to rapidly learn the multi-disciplinary set of skills needed to build robots and other advanced projects. Through our not-for-profit sister organization, The Ascendly Institute, we aim to reach kids in schools that are traditionally underserved by science and engineering programs of all types. Ascendly, LLC significantly defrays the cost of operations and contributes to the long-term growth, the scalability, and the health of The Ascendly Institute. One of the biggest joys in life is to point to something, and say, “I made that!” Ascendly kindles that joy in the young and prepares them for a lifetime of creating. Such preparation is good for the students, the communities, and the country. There is a growing recognition in the importance in re-instilling an engineering culture in our country and Ascendly strives to play a role in this effort.